– Scott Yates, VP, Electronic Data, Inc.
Master Your Minutes is a life-changing time management and productivity training workshop designed by New York Times bestselling author Kevin Kruse. It’s based on the world’s largest study of ultra-productive people—survey research on 4,000+ executives and qualitative interviews with 200+ self-made millionaires, CEOs, high tech entrepreneurs and even Olympic athletes. This live workshop will teach your team members productivity habits of the highly successful, enabling them to master their priorities, calendar, email, meetings and even overcome procrastination. What if a few new habits could dramatically increase your team’s productivity, and even 5x or 10x it in key areas? What if you could eliminate 33% of all meetings in your organization? What if you could implement a company-wide system to reduce email traffic by 54% and get your employees to Inbox Zero everyday? What if you could do all of this and improve their work-life balance at the same time? The Master Your Minutes training program makes that possible. 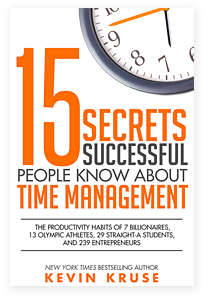 15 Secrets Successful People Know About Time Management by New York Times Bestselling author, Kevin Kruse, is the #1 selling book in the world on time management and productivity.